1. 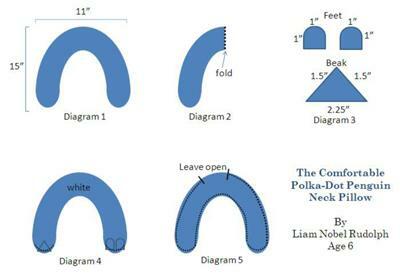 Cut one Polka-dot and one white fleece into a U shaped pattern (diagram 1). The U is 15" wide and 11" tall. To make the pillow even on both sides you can fold fleece pieces in the middle before cutting. 2. Cut out felt scraps for beak and feet. Each foot is a 1" orange square with one side rounded. The beak is a yellow triangle with sides 1.5" and 2.25" at the base. 3. Right sides together, placing the beak and feet on top of opposite ends of the white fleece U. Baste in place. 4.Right sides together, placing the polka-dot fleece on top of the white fleece. Make sure the sides are even. 5. Stitch all around except for about a 4" on the outside back edge (bottom of the U). Stitch the same way over again to make the pillow stronger. 6. Turn neck pillow inside out. Full free the beak and feet. 7. Stuff it until it is as hard or soft as you like! 8. Sew the opening shut. 9. Decide what kind of eyes you want to use and then glue or sew them in place near the beak. 10. You are finished! You can name your pillow and take it anywhere. This is such a cute sewing idea!!! I love it! Looks like a super cool & fun project!! What a darling idea! 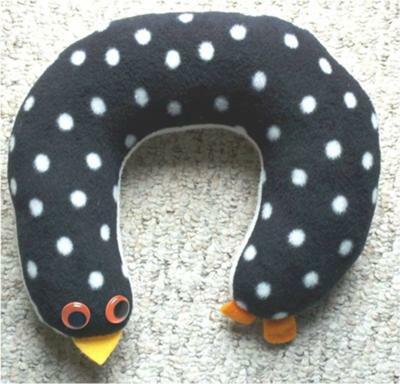 I love the idea of a neck pillow for kids! It would be such a cute gift for a any child. Pretty impressive the person who made this is only 6 years old! This is a great project. I love that the sewer is featured and he is only 6 years old! Excellent job.